Posted on September 28, 2007, 5:22 pm, by Amy Hoy, under articles, design, Home, web design. Creative Commons-licensed, copyright thetourist. 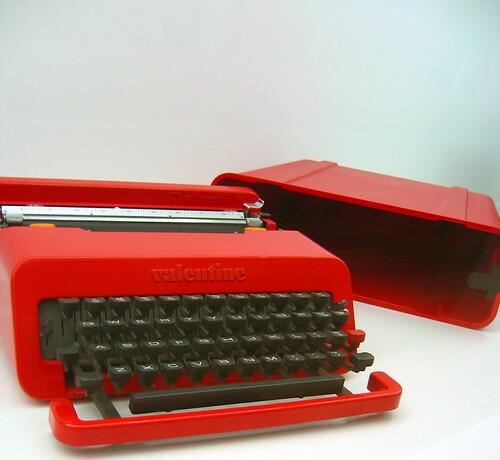 This is an Olivetti Valentine portable typewriter, photographed in the Musem of Modern Art. I just bought one, which inspired this post. Aside from my obsession with letterpress, I’m also obsessed with pen and paper, clay, photography (darkroom work, especially), Polaroids (1, 2), old postcards, unusual collage media, antique engraved book plates, hand-printed buttons and posters and stickers, handmade furniture, horseback riding, home cooking, and typewriters. I keep my journal by hand in a series of small, unlined, spiral bound books. I go through phases where I am completely taken with certain types of pen (I enjoy a good—and by good I mean ergonomic—fountain pen). I know how to crochet and sew (somewhat). I’m learning to play guitar. I want to learn how to build small electronics. I have an entire set of sketching pencils which I break out from time to time, regardless of my fuzzy warm feelings for Autodesk Sketchbook Pro. I’m not alone. A lot of people are developing a nostalgia and passion for “the real.” Considering the world we 20- and 30-somethings have grown up in, this is nostalgia for something we haven’t truly experienced: physical labor and craft. Things without undo. Things with substance; imperfect, ours. Humans are object-bound and tied to the real world, and we miss it deeply when we don’t get it as regularly as we should. As a designer, business person, or fellow human, you can use this urge to reach people. Also, it just feels really good: satisfying and right. A lot of people have picked up on this trend, but I don’t think it’s reached critical mass by any means. In terms of design, people are faking it, with more or less degree of success. They are creating and fostering things which cater to this urge. And inspiring, celebrating, and cataloging the efforts of people who engage in it. And, in some cases, intrepid and tech-savvy folks are interpreting and realigning the idea with a modern twist. We also can’t overlook the return to old-fashioned service, old-fashioned stores, old-fashioned printing and production methods. This is not just about design design, but also about business and experience and lifestyle design as much as anything. The possibilities are essentially endless, limited only by things that you can manage out here in reality—or what you can simulate, using design approaches and tricks, on the computer screen: texture, tactile, flavor, sound, feedback, how a thing responds. Reminds me of something my lord and savior, David Bowie, said in 1995: "A friend of mine who works in computers, in hi-tech industry, said that for him, he saw a 21st Century where people – to escape the high-concept, and the agonizing realization that we no longer understand or control our technology – would want to go home and touch something made of wood. And I think that is kind of the place that rock is taking. Things like grunge, for me…and rap, have a small, comfortable feel about them. They are…almost tribal. They’re things that you can touch; they’re made of wood." I was going to buy Sketchbook Pro, but it doesn’t work well on Intel Macs. I ended up with ArtRage. Still, there’s nothing like a real pencil and paper! I love old typewriters. I used to have a thermal one that was portable. It was about the size of a three-ring notebook and carried paper in its lid.